Voglibose is an anti-diabetes drug which inhibits the activity of α-glucosidase. Voglibose in pharmaceutical preparations is best analyzed using HPLC with post-column derivatization. The Shimadzu Voglibose Analysis system is the industry’s benchmark providing superior method capability to comply with the regulated methods. 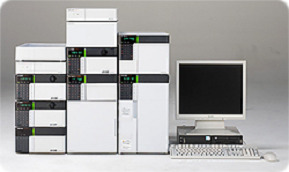 The system consists of Shimadzu Prominence HPLC equipped with the Post-column derivatization modules and the world’s highest sensitivity RF-20Axs Fluorescence detector. 15 Deg C. As the RF-20Axs is equipped with a cell temperature control which can work at 15 Deg C, the system does not need any external temperature-controlled cooling bath. The system provides excellent linearity at concentrations of 2-250 µg/L and meets the system suitability criteria as specified in Japanese Pharmacopoeia.